Hello my friends …as many of you know the Border terrier Posse from twitter have been raising funds for our fiends at Border Terrier Welfare and Terrier Rescue through sales of our calendar…..which you can now order at a reduced price from our dear pals at Feelwells….we have sold over 500 calendars I believe and we wanted to use the opportunity of the big dog show at Crufts to hand over funds to our two charities…..
……I had to travel from London by train to Birmingham in the middle of England…..Euston Station was furry busy…. ….but we had a nice comfortable seat with a good view of all the things and places whizzing past….and we were there in no time at all…. 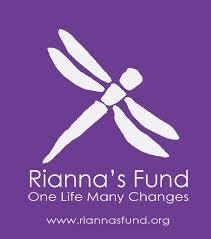 …..we arrived in plenty of time….there were good luck wishes everywhere we went…. …..in fact, I was pretty sure that I was being watched closely ….what do you think?…..
….I went immediately to the Feelwells stand to let my dear nephew, @hudson_bt, know I was there…he whispered some secret stuff to me I will tell you about later…. ….and I saw Mr Timmy @chillterrier there also…Mr Timmy was doing the posse proud as he was representing Pets As Therapy ….a very impawtant organisation who selflessly offer their services to cheer up poorly and elderly human beings……Mr Timmy was being very patient with everyone…he's a fine ambassador for PAT and the BT Posse…. ….I had a look round at Discover Dogs to see if there was anyone else there I knew….I asked this young Australian Cattle Dog if he by any chance knew my friends @dieseldawwg or @rugerblue or @punkiecowdog …who are all members of #CowDogGang on Twitter…. 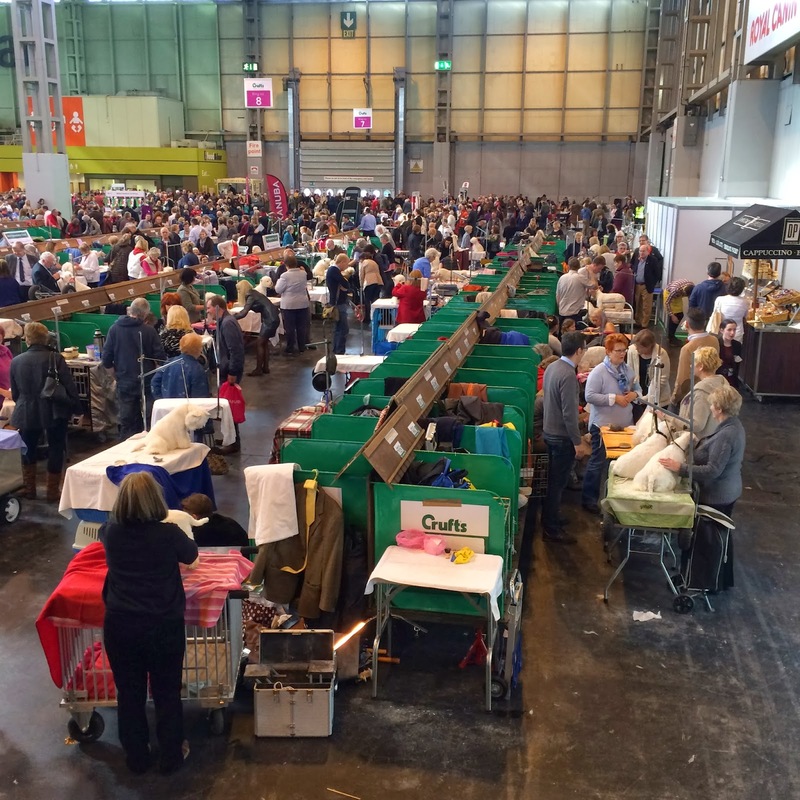 …..I think the Irish terrier Mafia had been sent to find me by @wonderwinger….I'm pretty sure she's having me followed…..
…..it was tremendously busy by the show rings….can you see all the doggies here having their grooming checked ?…. …..and I did an exhausting shift on the tills with my dear pals at @lilyskitchen…. ….the Dobermans PAW-sed for a chat…..(p.s. this young man was extremely friendly and gentle despite his steely gaze)…..
…..we met doggies from every corner of the globe…..
…and so were the Norwegians…..
….and there were loads of Cairn terriers there….I told them all about our dear friend @Oz_theterrier from Florida…..
….at one point I thought I had seen my friend and official Border Terrier Posse bodyguard @winstonwoofs….but it was just one of his relatives hanging around….! ….I had a very nice chat with the people at Fox Terrier Rescue…..although it might look like this young pup was in jail in fact he was in a large and secure pen in the middle of the main exhibition hall and he had lots of food, a human to play with and three other fox terriers to keep him company….they were having a fine time…..they were quite lucky that typist did not manage to smuggle them out of the show in his bag…he would like to have tried…. ….the border terrier folks at Discover Dogs were absolutely mobbed of course…. ….whilst the rough collies were somewhat more laid back….eh @cloonfurmegan? What sort of rabble is this?…. ….these mini-pals were somewhat more smartly presented…..
….whilst he was busy dog-sitting I had a Border Terrier Posse High Council meeting with @roroterrier…..
…we decided to abolish all taxes on terriers…. …and at 3pm we were able to gather to hand over the cheques to BTW and Terrier Rescue….the nice gentleman from BTW made a very touching speech and we felt enormously proud of the Border Terrier Posse and the hard work of the calendar team and the generosity of all the members and supporters who had generously donated their hard-earned money to help such great causes and our pals at feel wells who generously handled distribution….I think old Marley would be very happy with what we had achieved….in the pic you can see @harrison_bt's mum on far left, Mr Mike who works for @rohanthebt and is holding Hudson, some idiot, me (in pocket), the man from BTW, Mr Timmy, Miss helen and Mr Alfie from feel wells and Miss Caroline who works for Mr Timmy…and falling off the far right side is @katy_chaos mum….we were also joined there by @haggisadele who works for @monteeandjillee and @woodythebt's mum (who was too shy to talk to us!!) and also @alfielulu's mum…. …but she soon perked up when we showed her the bag of loot we had collected from her….all sorts of treats…. 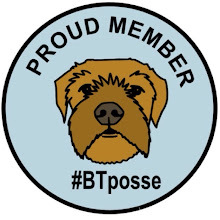 We had the very best of days and were pleased and proud to help represent the BT Posse….we had many members on site….and I got a great chance to chat with many old friends…. Pawsum blog Clapton! So bwill dat yoo gud go nd wepsent da posse! Fankyoo nd yooz investgatiff skils wunz der woz owtstandin! HIGH PAW. Awesome work Clapton. That's a big day out for a small hairy brown dog. Looks like a brilliant day out. You should have popped by the stand and sad hey to typist!